Educational Background: B.A., University of California Irvine, Chicano/Latino Studies, 2013. 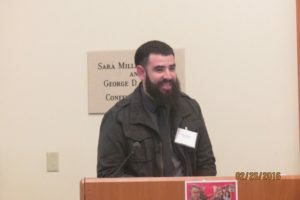 My research focuses on Mexican American and Chicana/o Marxists and Communists during the twentieth century including their involvement in cross-racial activism. In particular I concentrate on the August 29th Movement and El Centro de Acción Social Autónomo to analyze how they worked closely with African Americans, Asian Americans, Puerto Ricans, and Mexican communists between the 1970s and 1990 to create a new communist party. A third organization known as the League of Revolutionary is also crucial to my research and was a created out of the merger between the ATM, I Wor Kuen (a primarily female led Asian American group), and the Revolutionary Communist League formerly known as the Congress of African People led by Amiri Baraka. I examine the writings of the various groups including their polemics, propaganda, union organizing, and their common utilization of the Marxist canon such as the writings of Karl Marx, Vladimir Lenin, Antonio Gramsci, and Mao Tse Tung to understand how they provided alternative forms of organizing compared to cultural nationalism particularly during the Chicana/o and New Communist movements. I also analyze how the United States utilized surveillance and infiltration to stifle the activism of organizations that followed Marxist-Leninist-Maoist thought during the Cold War. For the 2017-2018 academic year I will be a Mellon Fellow for Dissertation Research in Original Sources awarded by the Council on Library and Information Resources.